415 Beacon is located on the south side of Beacon, between Gloucester and Hereford, with 413 Beacon to the east and 417 Beacon to the west. 415 Beacon is one of three contiguous houses (413-415-417 Beacon) designed in the same style and built ca. 1867 for shipping merchant Henry Wainwright and his wife, Ann Brooks (Parker) Wainwright, and their son, investment banker Henry Chapman Wainwright and his wife, Sarah Blake (Dexter) Wainwright. 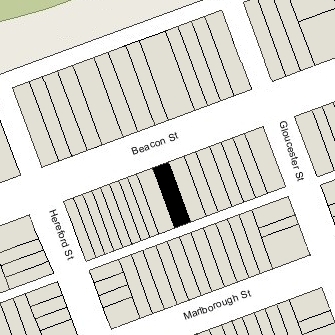 The land on which 413-415-417 Beacon were built was part of a larger parcel purchased from the Boston Water Power Company on February 20, 1863, by banker and broker Robert Marion Pratt. He was unmarried and lived at 13 Louisburg Square with his parents, George Williams Pratt (one of the founders of the Boston Stock Exchange) and Mary Barrow (White) Pratt. The Pratts also maintained a home, Oakley, on Belmont Avenue in Watertown (it became the Oakley Country Club in 1898). Click here for an index to the deeds for 415 Beacon. On May 23, 1866, the Wainwright family purchased the lots for 413-415-417 Beacon from Robert Pratt. The lot for 413 Beacon was purchased by Henry Chapman Wainwright’s wife. Sarah (Dexter) Wainwright; the lot for 415 Beacon was purchased by Henry Chapman Wainwright’s first cousin, Miss Anne Wainwright Davis, the daughter of Jonathan Amory Davis and Emily H. (Parker) Davis (the sister of Ann Brooks (Parker) Wainwright); and the lot for 417 Beacon was purchased by Henry Chapman Wainwright’s sister, Rebecca P. Wainwright, on behalf of their parents, Henry and Ann (Parker) Wainwright. When they were completed, 415 Beacon became Anne W. Davis’s home. She previously had lived in Dorchester with her widowed father, who had died in May of 1865. 413 Beacon became the home of Henry and Sarah (Dexter) Wainwright, and 417 Beacon became the home of Henry and Ann (Parker) Wainwright, their daughter, Rebecca, and their son and daughter-in-law, Isaac Parker Wainwright and Frances Caroline (Skinner) Wainwright. By 1880, Anne Davis had been joined at 415 Beacon by her cousin, Rebecca Wainwright. 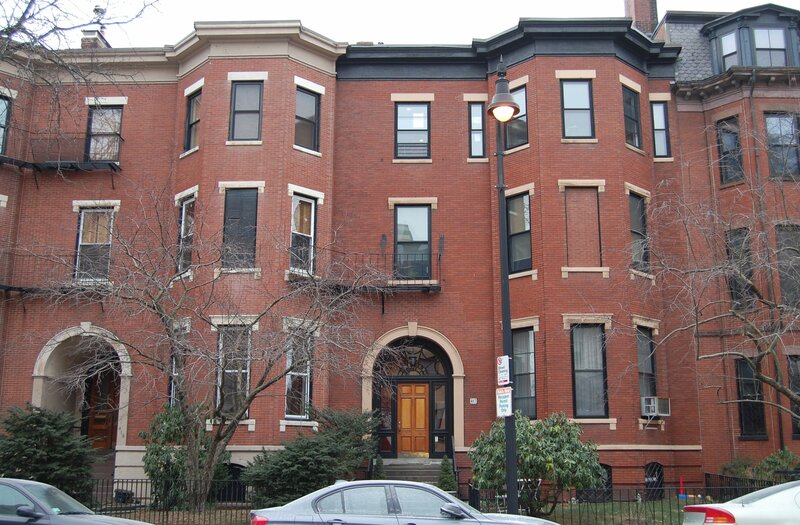 She had lived at 417 Beacon until about 1874, when she moved to 83 Beacon to live with her aunt, Mary Greene (Wainwright) Codman, the widow of Edward Codman, until her death in October of 1877. 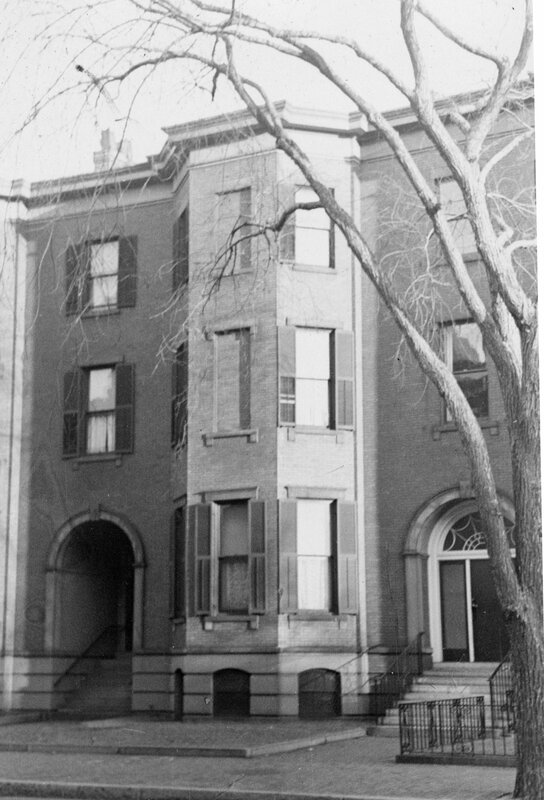 Miss Davis and Miss Wainwright continued to live at 415 Beacon during the 1887-1888 winter season, but moved thereafter. An October 14, 1888, “Table Gossip” note in the Boston Globe reported that Anne Davis “left last week with an invalid friend for California, where they will spend the winter.” Rebecca Wainwright moved to the Hotel Bellevue at 17 Beacon and then to an apartment at 409 Marlborough. Anne Davis continued to own 415 Beacon and lease it to others. By the 1888-1889 winter season, 415 Beacon was the home of cotton mill treasurer George Saltonstall Silsbee and his wife, Sarah Frances (Gray) Silsbee. They had married in September of 1888 and 415 Beacon was their first home together. In 1888, he had lived in Salem. They continued to live at 415 Beacon during the 1890-1891 season, after which they moved to a new home they had built at 512 Beacon. By the 1891-1892 winter season, 415 Beacon was the home of Frank Capen Herrick and his wife, Mary (Turrell) Herrick. They previously had lived at 154 Huntington. He was a newsstand operator and theatre ticket broker with offices located at the Hotel Bristol (northwest corner of Boylston and Clarendon). Anne Davis died in January of 1892 in Washington DC, and on April 28, 1892, 415 Beacon was acquired from her estate by Sarah (Dexter) Wainwright, Henry C. Wainwright’s wife. The Herricks continued to live at 415 Beacon during the 1893-1894 winter season, but moved thereafter. By the 1894-1895 winter season, 415 Beacon was the home of Anna Saltonstall (Merrill) Ward, the widow of Henry Veazey Ward. Henry Veazey Ward had been a merchant in Lima, Peru, and banker in London, and had served as Consul for Chile in Boston. She previously had lived at 21 Chestnut. Living with Anna Ward were her stepdaughter, Caroline Elizabeth Ward, her son, Robert DeCourcy Ward, and her daughters, Anna (Anita) Saltonstall Ward and Marian DeCourcy Ward. Robert Ward was a instructor in meteorology and climatology at Harvard, and later would become professor of climatology. He married in April of 1897 to Emma Lane and moved to Cambridge. Anna (Merrill) Ward died in April of 1901. Caroline, Anita, and Marian Ward continued to live at 415 Beacon. Sarah Wainwright died in April of 1907, and on August 9, 1911, Caroline, Anita, and Marian Ward purchased 415 Beacon from her estate. The Misses Ward continued to live at 415 Beacon and also maintained a home in Cape Neddick, Maine. Caroline Ward died in April of 1926. Anita and Marian Ward moved soon thereafter, Anita Ward to an apartment at 90 Commonwealth and Marian Ward to an apartment at 50 Commonwealth. On December 31, 1927, 415 Beacon was acquired from Anita and Marian Ward by Jessie Barr (Wright) Cutler, the wife of Dr. George David Cutler. They previously had lived in Brookline. He was a physician and surgeon, and maintained his office at 66 Commonwealth. They also maintained a home in Hyannis Port. They lived at 415 Beacon during the 1928-1929 winter season, but moved thereafter back to Brookline. On July 2, 1929, 415 Beacon was purchased from Jessie Cutler by Elizabeth (Brooks) Wheelwright, the widow of architect Edmund March Wheelwright. Their son, John Brooks Wheelwright, a poet and founding member of the Trotskyist Socialist Workers Party, lived with her. They previously had lived at The Austerfield at 7-9 Massachusetts Avenue. In August of 1929, she filed for (and subsequently received) permission to remodel portions of the interior, probably before she and her son moved to the house. John Wheelwright died in September of 1940, killed when he was hit by a drunk driver at the intersection of Beacon and Massachusetts Avenue. Elizabeth Wheelwright continued to live at 415 Beacon until her death in 1949. On November 22, 1949, 415 Beacon was purchased from Elizabeth Wheelwright’s estate by Henry H. Davis, an attorney, and his wife, Virginia Mildred (Nason) Lyons Davis. They previously had lived in an apartment at 52 Hereford. They continued to live at 415 Beacon until about 1951, after which they moved to 1 Exeter. On June 29, 1951, 415 Beacon was purchased from the Davises by Phillip G. Powell and his wife, Dorothy Powell, who operated it as a lodging house. They previously had lived in Chelmsford. In December of 1951, the Building Department cited Phillip Powell for failure to secure permission to convert the property into a lodging house and for lack of sufficient egress. In January of 1952, Phillip and Dorothy Powell filed for (and subsequently received) permission to convert the property from a single-family dwelling into a lodging house, including providing the necessary egress. On March 14, 1952, 415 Beacon was acquired from the Powells by Louis J. Binda. He was an elevator starter at a downtown Boston building who frequently held and conveyed property for various other owners. He was unmarried and lived in Cambridge. On the same day, he transferred the property to Dr. Robert J. Sherman, a physician. In April of 1952, Louis J. Binda (presumably on behalf of Dr. Sherman) filed for permission to convert 415 Beacon from a lodging house into six apartments and one doctor’s office. He subsequently abandoned the permit. In May of 1952, Robert Sherman filed for (and subsequently received) permission to convert the property from a lodging house into six apartments. He lived in one of the apartments and maintained his medical office at 311 Commonwealth. On May 31, 1956, 415 Beacon was acquired from Robert Sherman by Nicholas David Assaf. On December 31, 1957, he transferred 415 Beacon to his sister, Betty Assaf. By 1959, he and his wife, Elaine Frances (MacAuliffe) Assaf, were living in one of the apartments. The property subsequently changed hands and on July 1, 1969, was acquired by Francis C. Pratt, II. In April of 1969, he had acquired 413 Beacon. On June 4, 1976, 413 and 415 Beacon were purchased from Francis Pratt by Phillip M. Delales, trustee of the Fairborough Realty Trust. On April 4, 1983, P & M Associates (Harvey Madoff, president) foreclosed on its mortgage to Fairborough Realty Trust and sold 415 Beacon to Alan D. Humbert, trustee of the Rossignol Realty Trust. On May 26, 1983, 415 Beacon was purchased from Alan Humbert by Ann Cropp. 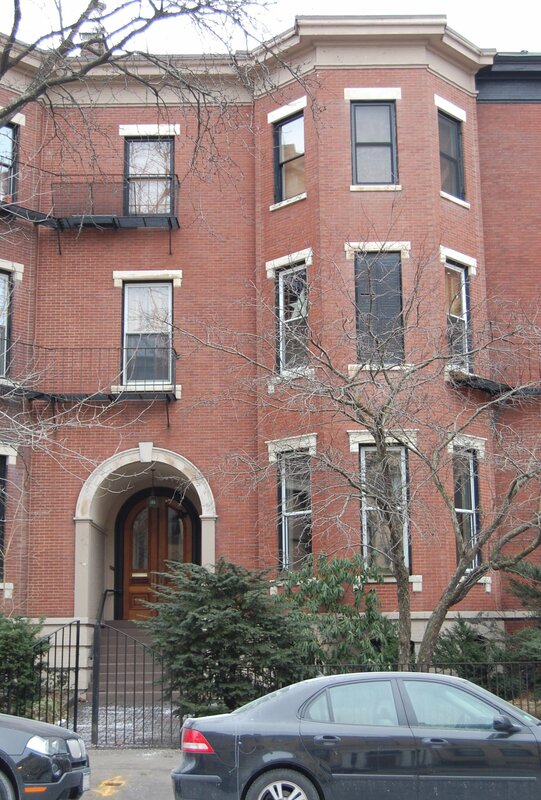 On February 28, 1992, she converted the property into six condominium units, the 415 Beacon Street Condominium.